Social Media and Content Marketing Experts Offer Up Best Tips and Instructions for Building Facebook Fans and Increased Engagement Through the New Tiimeline. Easy to follow step by step instructions include timeline setup, management, functionality, and insights to help social media marketers engage more fans. Changes on Facebook may seem challenging and time-consuming at first, but our guide will get you through the process quickly and painlessly, and help to build a more engaging and attractive social environment for your fans. On March 30th, 2012, Facebook will begin automatically converting all brand pages to the 'timeline' format. 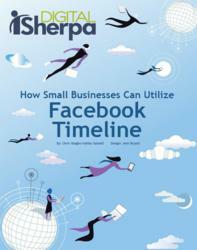 DigitalSherpa, the nation's largest content marketing service provider for small businesses, is pleased to offer a comprehensive e-book to guide social media marketers through setting up the 'timeline' on a brand page and offers up tips and best practices to fully utilize the new format's features. "Changes on Facebook may seem challenging and time-consuming at first," says Adam Japko, DigitalSherpa President, "but our guide will get you through the process quickly and painlessly, and help to build a more engaging and attractive social environment for your fans." The simple step by step instructions include how to make the most of your page visually through the cover picture, profile picture, "About Us," tabs, applications, and landing pages. Best practices on "pinning," "starring," milestones, and post management improve the functionality of the page. Tips for administrators using on the admin panel, sending effective messages, selecting publicly displayed brand information and planning future activity based on past success through the Facebook insights. Network Communications, Inc.(NCI) is a leading local media company providing lead generation, advertising and Internet marketing services to the housing industry. The Company’s leading brands are Digital Sherpa, Apartment Finder, The Real Estate Book, Unique Homes, New England Home and Atlanta Homes & Lifestyles. NCI has market representation in more than 500 local markets around the United States. The Company’s strategy focuses on providing high-quality and measurable marketing solutions to local clients by leveraging its proprietary prospect-focused distribution and content management infrastructure. NCI distributes more than 9.4 million local print catalogs of apartments for rent and homes for sale every month through more than 300,000 distribution points; NCI’s websites are leading Internet destinations for consumers looking for homes to rent or buy, with an average of 2.0 million unique users every month; and it provides Internet marketing services using social media tools to its customers.